We aren’t just saying that. Go to the K2 website and you’ll see that it’s not just a saying for them, it’s what they believe in when it comes to their K2 coolers on sale. They say they were spawned by the need for a cooler with a REAL VALUE that keeps items REAL COLD. What you’ll find as you dive in to take a closer look at the K2 lineup is that it’s true and we’ll do our best to show you just how different they are from the many others on the market. Here’s a closer look at our K2 Cooler Review. Like many other top of the line coolers, you’ll find that the K2 ice chest is roto-molded, which means that you will get the same design, every time when it comes to these coolers. Even cuts and design, mean better quality and higher ice retention rates. The outer walls of the cooler are built with UV stabilized polyethylene with a combined quarter inch of plastic insulating the cooler on the inner and outer walls. In between the walls you will find up to three inches of premium grade high-density polyurethane foam. This results in a cooler that gives you tremendous ice retention and strength to protect it from punctures and impact. Multiple colors like pink, brown, gray, etc. The ice retention times will vary due to conditions, but many have reported long ice retention times. One user mentioned frozen ice in the cooler for several days even though it sat out in the blazing sun. A rubber gasket placed in a channel around the lid to provide the best possible, re-frigerator-like seal. Cold stays in, heat stays out. Simple yet effective. An integrated hinge system is molded into the cooler and connected with a metal rod to keep lid permanently attached to the rest. Pretty solid, no doubt about it. Those rubber latches, mounted on molded-in keepers are designed to keep a positive seal. They’re easy to operate and ergonomic in use. No more slipping and sliding with the rubber feets. Simple yet necessary. An optional K2 Smoothglide Kit can be purchased separately (read on for more details). A drain plug with silicone gasket, designed for quick and easy drainage with just a partial turn. It always stays in so you won’t lose it. All K2 coolers, except of the smallest Summit 20, feature an integrated handles which make solo lifting a bit easier. Rope handles are also there, if you’re carrying heavy loads. Well placed anchoring points and padlock holes let you mount straps to keep your cooler safe and secure, respectively. Featured in the smallest K2, the 20 Quart one, this heavy-duty shoulder strap will help you carry your cooler wherever you go. 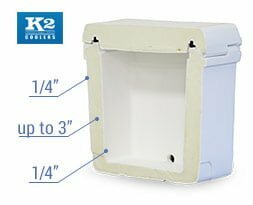 The 5 gallon water cooler from K2 is one piece roto molded polyethylene construction for extreme durability, comfort and easy carrying loaded with premium features such as gasketed lid, stainless lid latches, tie down strap guides, integrated handles, vacuum release plug, and polyethylene skids. Where Are K2 Coolers Made? If you’ve been wondering where are K2 coolers made, we’ll prompt to report that although K2 is an American company (based in Luisiana) and product designs are being made in US, their coolers are being manufactured overseas. The fact that they make actual products on the other side of the ocean is most probably a key reason why K2 has been able to offer much lower prices than competitors (think of Yeti, Orca coolers). So, do we care about it? Well, we think it’s just too attractive proposition to skip just because of their non-US build. The quality of K2 coolers is pretty awesome, the pricepoint is attractive, so we can live with the fact that they may lack a “made in US” label. Who Is The K2 Ice Chest For? And yes, we can confirm this wholeheartedly. K2 coolers are built for toughness, period. If you are out on the water, or do a lot of outdoor activities like camping, hiking or boating then you may want to seriously consider K2 as your next trip’s best buddy. If you require something less durable, then you may want to check out some other coolers. What Actual Users Are Reporting? One user reported looking at several other top of the line coolers and finally decided on the K2. The user reported great value and ice-cold retention. The user liked the padded shoulder strap and said the cooler worked so well that water bottles he placed in the K2 actually started to freeze. Another user said the K2 compares very favorably to the Yeti, but that you’ll save a lot more money. Yet another user mentioned the durability of this cooler, also mentioning that it competes very well with the Yeti, but at a much greater cost savings. The user also mentioned that the cooler was filled with ice and stayed frozen for four days even in the sun. Where Can I Buy One Online? Excited Yet? Wondering where to buy a K2 Cooler? If you are looking to pick one up, you can of course get one at the manufacturer’s website or check out a dealer location listed on the site, but the best value when it comes to K2 cooler prices is to buy online. Where can I get it online you ask? Glad you asked, you can check out Amazon for some good K2 cooler prices, plus you may as well be getting free shipping nationwide. You will find a wide selection of K2 coolers for sale over there and will surely be able to find the one you want. K2 Coolers Vs Yeti: Which Is Better? When you are looking at manufacturers like Chevy, Ford or any other popular lineup, the question always comes up – which one do you choose? While we could take the easy way out and say they are all good, we want to answer your question. They are both roto-molded, they both have a wide variety of sizes to choose from and they both have long ice retention times. However, there is one area where the K2 cooler wins and that are in its price. What you’ll find is that the build and ice retention among K2 vs Yeti coolers is pretty similar, but where the difference starts is in what you’ll pay. You’ll see that the K2 line is much more affordable. Take a look at both and make up your mind for yourself, but if you are asking, then we are saying – we would choose the K2. The choice here is still up to you, but we hope that we were able to give you a comprehensive view of the K2 coolers for sale to help you to make a well-informed decision. Need your cooler to stay in place? Check out these corner chocks made of heavy-duty rubber for you to mount your cooler wherever you choose. Would you leave your car door unlocked or your bike out in the open for anyone to take? Of course you wouldn’t. If you want to secure your investment in this high-quality cooler then you’ll want this cable lock designed specifically for the K2 ice chest. Whether you are on the water or on the open road, you won’t always have a smooth ride. To ensure that your cooler is secure, pick up these straps to keep your cooler safe at all times. What good is a cooler if you don’t have ice? If you are constantly using your cooler, then purchasing ice on a regular basis can get pretty expensive. Off set this issue by getting some of these ice packs made just for the K2 ice chest. If you are the only moving things, then that cooler can get pretty heavy pretty quickly. If you need to drag your cooler from point A to point B and are in an area that can accommodate sliding, then you just found the perfect accessory right here. Coming in at four to a set, you’ll be able to slide your cooler wherever it needs to go. You can find even more accessories on Amazon, here’s the full list of what’s currently available. There are many differently sized K2 coolers for sale to choose from and we hope that this K2 cooler review helped you to better understand the product, so you can make a well informed decision. At a great value and comparing well to others like the Yeti, you may want to give deeper consideration to the K2 ice chest. TIP: If you are interested in other premium coolers then go and read our review of Iglo and Engel coolers. We also posted a lot of helpful tips on our homepage. TIP: A video below demonstrates one more neat add-on for the K2 : A custom-tailored K2 Cooler Hydro-Turf Mat. If you ever going to stand on your K2, it’s going to help you stand confidently by providing excellent traction.